This exercise can be fun, and may be surprising. Ask everyone in your family to track their food expenses for a month using the printable chart. Each time you spend money on food anywhere, write your initials on the back of the receipt and put it in a jar. If you don’t have a receipt, make a note including what was bought, who bought it, and how much it cost. Start by downloading the Tracking Food Expenses worksheet. Think about where you buy food: grocery store, restaurants, school lunch, the soda machine at work, popcorn at the movies, coffee shop, bottled water at the convenience store, etc. At the end of the month, spread out all the receipts/notes, put them in stacks by location, and enter the prices into your chart. Add up the totals and look at how much you spent at each location. Do you eat out more than you expected? Can you find less expensive places to eat out? Can you share dinners with friends or have potlucks instead of eating out? Do you need to learn new skills or find new recipes to make eating at home more fun? Can you bring more food from home instead of buying it away from home? It is OK to start small and make one change each month. In time, the change will add up to big savings. Unit pricing is a way to compare similar products to find the best value. For example, carrots are available in different forms: full-sized and baby carrots. They are also available in different sized bags. Figuring the unit price can help you determine which carrots are the best value. *The full-sized carrots are the best buy. Consider whether you have the time to get the carrots peeled and cut up this week. If so, save money by buying the full-sized carrots. If you are buying products that have Nutrition Facts labels, you can use the label to help you make your choice. For example, cereal often comes in different sized boxes. How do you know which box is the better price? The Nutrition Facts Label will tell you how many servings are in each box. Then divide the price by the number of servings in each box to determine which has a lower cost per serving. *Box one is a better buy. Unit pricing can also help you decide which form of a food to purchase. For example, green beans are available fresh, frozen, and canned. Food waste is a big problem in the United States. According to Feeding America, 25-40% of the food grown, processed, and transported in the US will never be eaten. Food is the number one source of solid waste in American landfills. Food waste is not only bad for the environment, but it also means wasted money for your family. There are steps you can take to keep waste to a minimum at your home. Plan meals and snacks carefully. Buy what you need and make a point of using any perishable foods like fresh fruits and vegetables before they spoil. Don’t know what to do with your leftovers? Utah State University has a collection of resources called “Create” that is all about making use of leftovers in new and interesting ways. Be food safe. Store food appropriately and keep perishable products at a safe temperature. Keep your refrigerator at or below 40º F. Store raw meats in a container or dish to prevent juices from leaking. Check for quality. Check the dates on foods when you’re shopping. If you purchase meat or other perishables with a short use by date, plan to cook or freeze them quickly. Stay organized. Keeping your refrigerator and cupboards organized will help you prevent waste. You’ll be more aware of what is in it and what needs to get used quickly. Arrange supplies so the oldest items are in front so you will see and use them first. Use see-through storage containers for leftovers. Label, date, and freeze them in meal-size servings. Always check your leftover supply when meal planning so you can work them into your plan. Freeze what you can. The National Center for Home Food Preservation has tools to help you decide what to freeze and how to do it in a way that maintains the food’s quality and safety. Donate. If you have non-perishable food that is not expired, but your family can’t use it, donate it to your local food pantry. How to eat cheap -- but healthfully -- despite rising grocery costs. Katherine Tallmadge, RD, says, "Take inventory of what you have on hand so you don’t overbuy. Create a detailed shopping list based on your needs and weekly menu plan, and take into account how you plan on using leftovers." The savings came from reducing portion sizes and from buying fewer of the high-calorie foods that tend to increase the amount spent at the grocery store. People tend to spend a lot on those "extras" -- foods that add calories but little nutritional value, like sodas, bakery items, and chips. "The ideal food is nutrient-dense not calorie-dense, and the least expensive may be fresh, frozen, or canned," Tallmadge says. Connie Diekman, RD, says, "Save money by passing on calorie-dense cakes and cookies. Instead, opt for seasonal fruit. Fruit is fat-free, high in nutrients and fiber, and a natural energizer." Check the food section in your newspaper to find the best buys for the week based on fresh produce in season. Food in season is usually priced to sell. During the summer months, corn on the cob can cost as little as 10 cents an ear; at other times of the year, it may cost 10 times as much. Also, shop your local farmers' market for great deals on local produce; the prices won't include shipping costs. Planning meals around what's on sale can lower your grocery bills, especially if you also use coupons. Just make sure they're for items you would buy anyway. Sunday newspapers are full of coupons and sales circulars to get you started. It's also a good idea to stock up on staples when they're on sale. "Buy one, get one free" is basically a technique to get you to buy twice as much as you need at half the price. At some markets, though, the product rings up half-price -- so you don't have to buy more than one to get the savings. Use your freezer to store sale items that can be used at a later date. Making lunch and taking it with you is a great money-saver and an excellent use of leftovers for meals at work, school, or wherever your destination. "Packing your lunch not only saves you money, but you can control all the ingredients so they are healthy and low in calories," says Diekman, who is nutrition director at Washington University. Pack a simple sandwich, salad, soup, wrap, or a hearty snack of cheese. Use freezer packs and containers to keep food at the proper temperature unless you have access to a refrigerator. Next time you're gathering ingredients for a recipe, try using frozen, canned, or dried foods. They may be less expensive than fresh, yet they are equally nutritious. Produce is typically frozen, canned, or dried at the peak of ripeness when nutrients are plentiful. Fish and poultry are often flash-frozen to minimize freezer damage and retain freshness. With frozen foods, you can use only the amount you need, reseal the package, and return it to the freezer. If it's properly stored, there's no waste. Canned foods are often sitting in a bath of juice, syrup, or salty water and usually require rinsing. Dried fruits are concentrated in flavor and a great substitute for fresh fruit. Also consider using powdered or evaporated versions of milk in soups, casseroles, mashed potatoes, or desserts. Buy the form that gives you the best price for your need. When possible, substitute inexpensive vegetarian sources such as beans, eggs, tofu, and legumes for more expensive meat, fish, or poultry. Eat vegetarian once a week or more to increase your consumption of healthy plant foods while saving money. Eggs are an excellent, inexpensive source of protein that can be eaten for breakfast, lunch, or dinner. You could also try using a smaller portion of meat, fish, or poultry and extending the dish with whole grains, beans, eggs, or vegetables. When you do buy meat, choose smaller portions of lean cuts. For example, lean cuts of beef are those that include the terms "loin" or "round." (You can tenderize lean cuts of meat mechanically or by marinating them.) You can also buy a whole chicken and cut it up instead of paying the butcher to do it for you or buy the cheaper "family pack" and portion it into airtight freezer bags. Before you toss perishable food into your grocery cart, think about exactly how you'll use it. The Environmental Protection Agency estimates that Americans generate roughly 30 million tons of food waste each year. Using leftover vegetables, poultry, or meat in soups, stews, salads, and casseroles minimizes cost and demonstrates your creativity in the kitchen. For example, have a roasted chicken for dinner one night and use the leftovers for dinner the next night. Try topping a bed of fresh greens with vegetables, fruits, and slices of leftover chicken. Add a loaf of whole-grain bread, and presto! You've got a nutritious meal in minutes. You can also eat leftovers for breakfast or take them with you for lunch. Consider buying store brands instead of pricier national brands. "All food manufacturers follow standards to provide safe food and beverage products of high quality," says Robert Earl, director of nutrition policy for the Grocery Manufacturer Association. Many grocery companies buy national-brand products made to their specifications and simply put their own label on the products. Read the ingredient list on the label to be sure you're getting the most for your money. Ingredients are listed in order by weight. So when you're buying canned tomatoes, look for a product that lists tomatoes, not water, as the first ingredient. Also look for simpler versions of your favorite foods. For example, buy oatmeal or simple flaked or puffed cereals that contain fewer additives and are less expensive (and often healthier) than fancier cereals. 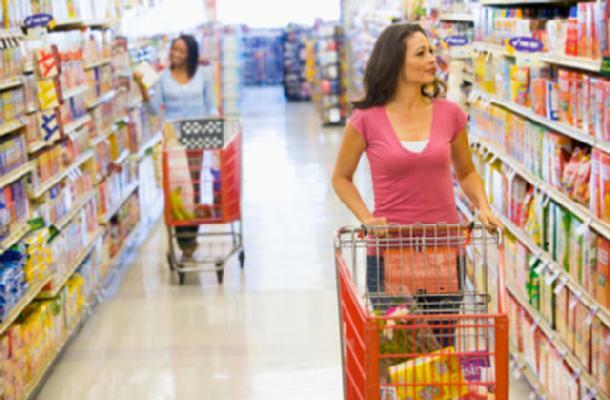 Joining a bulk shopping club like Sam's, Costco, or BJ's can be cost-effective if you frequent the club regularly. Bulk purchases can be a great way to save money -- as long as they get used. You might also look in your community for shopping cooperatives that sell food in bulk at a substantial savings. Cooking in bulk can save both money and time, says Tallmadge. "Prepare food in bulk and freeze it in family-sized portions, which saves time in the kitchen," she suggests. For example, making a big batch of tomato sauce will be less expensive (and probably tastier) than buying it. For benefits that go beyond cost savings, plant your own produce. There's nothing better than a summer-fresh tomato from the garden. Tomatoes even grow well in containers if you don't have space for a garden, and some neighborhoods offer community gardening spaces. Start small, and see how easy it is to grow fresh herbs or a few simple vegetables. And if you invest a little time in freezing or canning your harvest, you can enjoy summer's bounty all year long. According to the Bureau of Labor Statistics, the average American married couple spent about 12 percent of their income on food in 2017, while a single parent with at least one child under 18 spent almost 15 percent. Of course, we all have to eat, but there are ways to reduce the amount you spend at the grocery store and at restaurants. While clipping coupons and using grocery store apps are common, a far more effective way to save money is to stop wasting so much food, says Gary Foreman, the president and founder of The Dollar Stretcher in Sarasota, Fla.
1. Plan your menus. 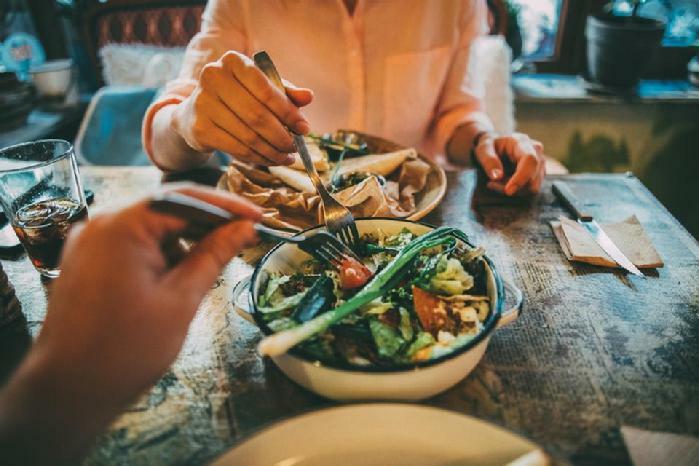 Americans spend a lot of money on buying food away from home, in part because they haven’t organized meals for themselves or their families, says Holly Johnson, a frugal living advocate. Even fast food costs more than it used to — and fast casual restaurants can, she says, cost as much as $45 or more for a family of four. Making a grocery list and sticking to it is one of the most effective ways to spend less at the store. Johnson recommends picking at least a few cheap meals to make each week, such as eggs or spaghetti for dinner – especially if you have kids. Foreman suggests putting together dinner plates – each with a portion for one person – in the freezer, dated and labeled with the contents and date. He also suggests keeping an inventory of these meals on the refrigerator door so teens and adults can find something to reheat for dinner themselves on busy evenings. You can also deliberately make a double-portion of some meals – casseroles are a good candidate – and partially cook one portion, then freeze it for a future dinner. In addition, he suggests, consider portion size carefully when you’re shopping. “A four-year-old doesn’t need to eat a quarter-pound of hamburger meat, so you can save money and be healthier if you reduce the amount of food you serve at each meal,” he explained. Out-of-season fruits and vegetables can get expensive and you may be more likely to throw away fresh items before you have a chance to use them. You could try growing some of your own produce if possible to reduce the amount you purchase. 4. Reduce your dining-out dollars. If you’re on a mission to drastically cut spending, the simplest plan is to eliminate eating out, says Johnson. At the very least, try to cut back to once or twice a week at most, she advises, and share appetizers and entrees for a lower bill.